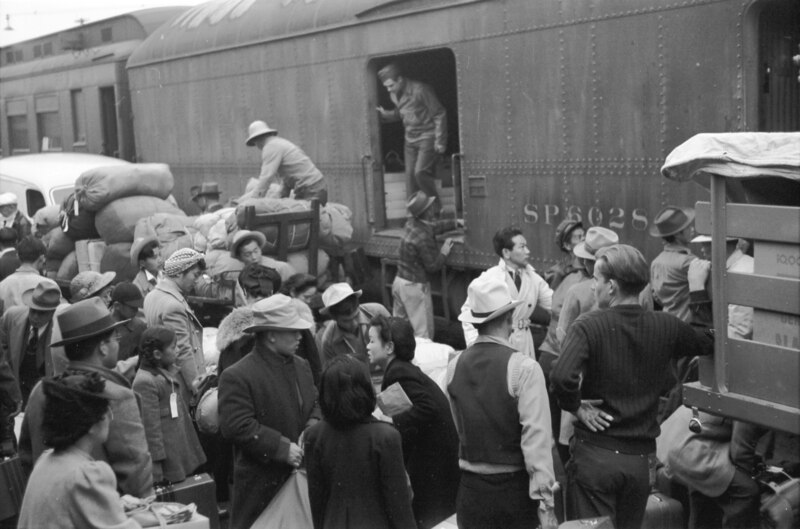 Japanese Americans boarding a train bound for one of ten American concentration camps. One Japanese word might hold all the wisdom we need to survive during the most challenging times in our lives. This Japanese word was used as a survival mechanism to cope with the harsh conditions in the internment camps during WWII, where Japanese Canadian and American were relocated when they were suddenly considered enemies of the State. During these unbearable moments for people who were citizens of their own country – but denied all their rights, put in camps guarded by men with loaded guns and barb wires, the word ‘Ganbatte’ became viral. Interned Japanese Americans and Canadians shared this word that no guarded man could understand. It was the best and only weapon they could use against the enemy, a silent and pacific way to cope together – in a collective and sustainable way -, to the harsh inhuman conditions to which they were submitted. In Japanese, the word or expression ‘ganbatte’, means  to ‘endure and persevere’. It is a word – or expression – commonly used in Japan when a life challenge arises and people feel the need to cheer others up or comfort each other. In fact, it’s also a way of saying: ‘if you have survived until now, it means you have something precious to offer to this world’. I have often felt this way. What about you? Some of us have endured years of life challenges. It is exactly during those times when we think we can’t keep going, that we must repeat to ourselves : ‘ganbatte’. We might have gone through this suffering to learn the notions of detachment and/or impermanence and become the embodiment of compassion and love for all. When we learn to ‘persevere and endure’ during our darkest times, we discover new gifts that were hidden inside ourselves and a strength that we never thought existed. We might suddenly feel as if we are connected to everything around us, understanding that we are all one, interconnected in a web of particles and light. Sometimes, all we need is a real angel or a sign that allows us to keep moving forward, or that helps us to turn the light back on. Many of us have met angels, even if we didn’t recognize them at first. And they might be the reason we are still shining our light. The first angel I met was a 90-year-old landlord, who owned the duplex I moved in after a difficult relationship ending and many other life challenges. A year before, I had lost a long time job and that first event was the beginning of my whole life falling apart. Everything material and everybody around was lost. This angel on my journey was the type of angel that is silently extraordinary! He was a determined rebel, a free thinker! He was one of the last veterans of World War II. At 90 years old, he was probably more in shape than most 60-year-old men, his strength coming from within. And a light that nobody could have dimmed or turned off! He had suffered so much, saw so much pain, that he chose life and to see the good side of it, no matter what happened. Mr. Charlebois was much more extraverted than me. I had always been the introvert type. When I met him, he turned on the magical light within me, that had been turned off since I was a kid. Angels bring magic into people’s hearts just because of who they are. We recognized each other’s souls as two rebels, two misfits. One time, after we went shopping, we stopped on our way back at a local coffee shop. I will never forget that moment. When we sat down, he started to tell me about his work during World War II. I was speechless. As a telecommunications officer, he was listening all day to the enemies conversations to prevent future attacks. It was my first and only direct contact with World War II. He was 90, had the shape and the mindset of a much younger man, but I knew he was most probably in his last years, if not the last one. I knew that his story had to be told, that he was someone extraordinary who had always been in the shadow; he reminded me of myself. I made him a promise that we would meet again so that I could share his story with the world. He became the first angel that lit the fire of the awakened person I am today. He was the first to show me how to transform myself from inside out, by being true and accepting of my own nature and talents. Every time I called him to fix something in my apartment, he came up the stairs with a smile and humor! His positive energy filled my apartment. That man was full of wisdom and nobody saw it. Whatever the challenge was, he always enjoyed it. It was just a matter of finding the right angle, the right way to look at something and persevere. He also understood the meaning of the word ‘ganbatte‘: to persevere and endure, as a veteran of a bloody war that has killed thousands of lives and left countries completely ravaged. By looking at things from the right angle, at what we can learn from a challenging experience, by learning new life lessons that will guide us, is also how we can ‘endure and persevere’. All his jokes came from his heart. He was true and authentic. That’s why I laughed every time at his jokes; I recognized where it came from. He was a real angel. Not all people have the ability to recognize angels. And very few can recognize the gift of meeting an authentic person! This angel who came my way was showing me what I had been trying to do all my life: how to be authentic and embrace myself, no matter how others thought of me. That time at the hardware store, his wife looked at me with an irritated look and said: ‘he always speaks to strangers’. I don’t know what my exact response was to her, but I remember reassuring her that he was feeling good about it and that his humor also made other people feel good. By being what some people would consider his weird authentic self, he showed me who I should become : the real me. He often told me : ‘have a look at the cars in this parking. Do you see many cars that are the same exact color, year and brand? They are all different, just like us.’ He was full of wisdom in a simple and bold way. And this wisdom went unnoticed by his own tribe all his life. He was an older copy of me in a way! He also told me often how getting mad was a loss of precious energy, as I was sharing with him the bad tempers of many of my family members, my mother in particular. He repeated often a French expression that would translate word by word to : ‘it takes more time for a cat to get down the curtains that it took it to go all the way up’. He was showing me that what I had experienced and seen from my parents was the wrong way to go for me. Angels always go unnoticed. The ones with the good hearts, the weird ones, the rebels without a cause. Mr. Charlebois was one of those. He seemed like he was nobody special, but he never went unnoticed anywhere, because of his positive mindset and his shining light. During the hardest times of my life, he became the most important role model and teacher I had. He allowed me to endure and persevere during everything I went through after that. He was my ‘ganbatte’. I still think about him or talk to him when things get hard. Because I lost everything so much these two years, people started to point fingers at me, to see me as the problem. But these struggling years were precious. My world went upside down from one trauma to another, to remind me, that all changes start within. Mr. Charlebois is the first one that opened my eyes, he was the first spiritual father I had. He was always non-judgemental and showed me how to cope with life challenges – the most important skill in life -. I realized it afterward when I started to awaken to my real self. Without him, I don’t know whether I would have survived everything I went through or even became the better me, the real me, that was hidden under years of layers of obedience, by fear of rejection and conditional love. He died last summer and I hadn’t seen him for months because of everything I was going through. During those challenging years, the thing I wished the most every day was to go and see him, but as every day was a battle, it had to wait. The Universe had other plans. When I was finally able to see him, I learned through a neighbor that he was at the hospital. After many days of communicating by email back and forth with his daughter, I saw him, one last time! The day I was allowed to see him, he was completely alone in his room. I had never talked to a dying person before. When I saw him, as an empath, I knew that a lot of his cells had already died and were dying continuously every second. For that one last time with him, I had hidden my dog in a bag and brought it along with me. I needed his presence; it was also a symbolic act. Charlie – my dog – had always loved him, a reciprocated love by Mr. Charlebois, and I knew telling him he was there with me, would make him feel happy, before leaving this material world. As I approached his bed, I felt insecure about how to act, how to talk to him. I had prepared myself in the bathroom, repeating my speech, but when I finally saw him, I felt like I was going to fall into pieces. He was looking my way; it was hard to see his reaction because he was dying and could barely move, but I felt him receive my words right through his heart. As I had just finished saying my last words to him, his face expression suddenly became constricted and he turned around in a fetal position, as if he was slowly preparing to get born again into something else, dying from this world but reborn in another one. The nurses said he was in pain after that, but what I felt is that for the first time in his life, I showed him it was alright to listen to his emotions and what felt right for him. And it probably opened a very tightly closed gate of pain within himself, bringing back years of suppressed painful memories before letting it all go. It sounded to me like a painful primal cry before his final breath. It was my way of being an angel for him, to set him free from all his pain and past sufferings. I was the one being his angel at that time. I didn’t think I would see him again, but I couldn’t bear to see him all alone in his room in his last moments of life. I offered his daughter to go read for him or put on old history documentaries. When I opened my email two days after, I felt in shock, but I knew already that he would die soon after I had left. After I had left the hospital, I had cried in the parking lot, feeling like falling apart into pieces, with nobody to share the depth of the pain I felt. There were no words. I felt an intense sadness, almost like despair. I was unable to talk or see anyone for hours. The email his daughter sent me that day was brief and cold. She reminded me very much of my dad, a lawyer like her, in her distant and cold way of being with humans when emotions where involved : ‘My dad passed away’, she wrote. ‘The nurses went to see him after he had a very hard time breathing. There will be no funeral, according to his wishes.’ The absence of funeral, coming from a the black sheep of the family, wasn’t a surprise to me. I loved him very much, I still do; he was like a father to me. Just like he had been my angel, I had been his, for a few minutes. He came in my life to show me how to become the better me, the real me, that was hidden deep within. He showed me how to endure and persevere during my awakening to my new self. Thank you, Mr. Charlebois. You were my first light. I will always remember and love you as a father and friend. I might talk to you whenever I need your fatherly guidance. You are welcomed to visit me whenever you want. You showed me everything a daughter would have hoped for. And I owe you my life for that. I will keep my promise of honoring you by being authentic to who I am, a soulful rebel writer. Thank you for bringing me back to life. I can now carry your light in the world. —This text is dedicated to Mr. Robert Charlebois, a curious soul, a rebel, a free spirit, a funny and witty spirit, an innovator, a telecommunications specialist during World War II. An amazing soul father and angel. He died last year at the age of 91 years old. He will always be remembered. Sophia Wisdom is a Spiritual Writer. She dreams of a world, where each one us could be what they were meant to be. She traveled in over twenty countries, lived in three, and is planning to visit all the wonders of the world while living as a Spiritual Writer and Motivational Speaker. She is currently working on creating opportunities, to share her story of empowerment, through speaking engagements and publishing a book on rethinking the way we think and solve issues in the world through inner and outer awareness, the end of separation between disciplines and the integration of the lessons from history, ancient and actual knowledge. She also shares her spiritual awakening path through Instaquotes and Instapoetry @sophiawisdomwriter.